Even when a couple are about to get married, there is only one aspect to life which is inevitable and that is death. Where one half of the couple dies long before the other, this can spell something of a financial catastrophe, particularly when death is premature and the couple already have young children. One spouse left alone to bring up the kids can be very trying indeed, even in the modern world where government support programs abound in western society. But it's not only the kids who will weigh heavily on the finances. There are other monthly expenses to consider such as car payments, house rent or mortgage, possibly credit card debts and maybe other debts besides. If the married couple decides to take out life insurance then one can name the other as the sole beneficiary. Thus, if one dies then the other benefits from the financial payout from the insurance policy. What's more, in the very unfortunate case that both parents die and they have children, the children can earn financial security by being named as beneficiaries. Although younger couples will often believe that they do not require life insurance, after all, who wishes to think about death when for many people this should be one of the happiest times of their lives, taking out life insurance earlier means that the premiums will be less. Even more so if both spouses are in good health (and don't smoke). What's more, younger people have a higher chance of being approved for a life insurance policy. Early on in a marriage, expenses tend to be high. Both spouses may well be on the career ladder, and with that comes the almost obligatory new car (or two), new house (plus furnishings etc. ), along with holidays abroad. If children enter the equation, then it's all change and the financial focus takes on a different light. 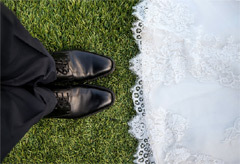 Should one spouse pass away, is the other prepared for the financial plight that lies ahead? Plus, the funeral has to be arranged. The average funeral in the U.S. now costs around $7,000 and that's only for the funeral – there are other issues to be taken care of besides. Life insurance can be used to cover the cost of a funeral in addition to the other post-death expenses that are a part of the ordeal. Of course no one wishes to think about death and all that it might entail, but the sad fact is that it cannot ever be avoided. Thus it is wise to take the precautions of doing some early planning, the most important of which at this stage is to invest in the most appropriate life insurance policy that's available for yourself and your spouse as a couple. Couples' insurance should not be seen as an unnecessary evil. Rather than viewing it in a negative fashion, consider it as a way to secure the financial future of yourself and your current and perhaps future family too.